This article is from Britain, but it pertains to us just the same. Take advantage of these helpful tips this summer! How can I get to sleep in hot weather? Getting to sleep when it’s hot and stuffy can be a nightmare. But if you’re craving a few Zzz’s there are a few ways you can help yourself to drift off despite feeling hot. Here are a few easy tips. As tempting as it may be, don’t whip off your undies just because it’s sunny. Instead, sleep in cotton pyjamas, to let your skin breathe and ensure that any sweat is soaked up, rather than left on your body. Giving your bedding a very light misting of water can make all the difference when you’re struggling to sleep on a hot day. 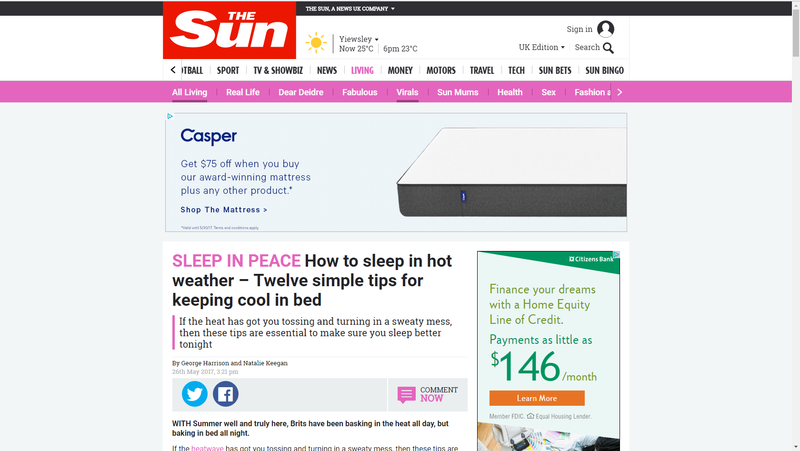 Don’t soak your bed, but sleeping in some slightly damp sheets could help to cool you down and keep you comfy. Another use for your slightly damp sheets involves spraying them with water and then draping them over an open window. This lets the breeze blow some refreshingly cool air around your room, without the added noise of using a fan. Turn off all the plug sockets you can to help keep things cool – and save some energy whilst you’re at it. Electrical sockets kick out a surprising amount of heat, and they could be the difference between a good night’s sleep and a sweaty nightmare. Make a cold water bottle which won’t melt all over you by filling a sock with rice, and then freezing it. Press this against your sensitive pulse points – found on the wrists, ankles, tops of your feet and your temples – to instantly turn the heat down a notch. Boozing before bed is never a great idea – but your sleep will be affected even more when it’s hot. Instead, make sure you keep a cool glass of water by your bedside to stop you from overheating in the night.